Earn 60 Gold Points in My Nintendo! As we celebrate 20 years since the launch of Pokémon Red and Pokémon Green in Japan, the next era of Pokémon games is being announced! Pokémon Sun and Pokémon Moon are coming out for systems in the Nintendo 3DS family in holiday 2016, with a new world, new Pokémon, and new adventures to discover! Using Pokémon Bank, you’ll be able to transfer Pokémon you’ve caught in the Nintendo 3DS Virtual Console versions of Pokémon Red, Pokémon Blue, and Pokémon Yellow into your copy of Pokémon Sun or Pokémon Moon. 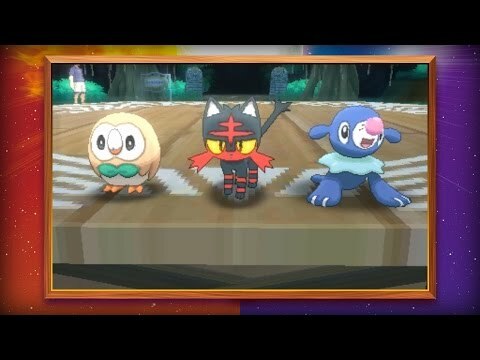 Pokémon from Pokémon Omega Ruby, Pokémon Alpha Sapphire, Pokémon X, and Pokémon Y can also be brought into Pokémon Sun and Pokémon Moon in the same way. Visit the Pokémon Bank page for important details on the planned update to support Pokémon Sun and Pokémon Moon. Pokémon Sun and Pokémon Moon will be the first games in the Pokémon series to allow players to choose from nine languages to play in. In addition to English, French, German, Italian, Japanese, Korean, and Spanish, players will now be able to play in both Traditional and Simplified Chinese.